Moore Park Stables have horses and ponies to suit riders of all ages and abilities, ranging from beginners who have never ridden before up to fully experienced riders. Moore Park Stables is owned and operated by Rosemary Gough, qualified E.F.A. N.C.A.S Level 1G, SSTA riding coach and accomplished show rider. 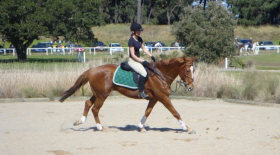 Rose operated for over 25 years at the Centennial Parklands Equestrian Centre (Formally the old Sydney Showgrounds). Rose teaches all standards of lessons from beginner to advanced and specialises in dressage lessons and the competition rider. Rose herself, is still a regular competitor and has several of her own horses which she successfully shows all over New South Wales. 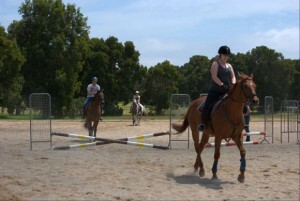 Regular riders at Moore Park have plenty of opportunity to compete both onsite and locally and Rose is more than happy to arrange transport and provide horses for her students to compete on. This is a valuable part of the learning process and allows her students to progress through their competitive experiences. Her new facilities are excellent. Rose has a large range of well schooled horses and ponies who are suitable for all standards and ages of riders. Many of them are ex – competition horses from a variety of equestrian spheres including dressage, showjumping and eventing. All our horses are carefully matched to the skill of the rider, and all necessary safety equipment is provided. We offer individual or group Dressage classes based on classical Dressage instruction, all conducted on well educated horses which can be booked at the riders convenience. Our experienced instructors are happy to cater the lesson to your individual requirements and competition training is available. Do you wish to make your child’s birthday party one that will be remembered with a pony ride at their party. 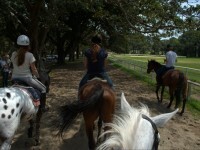 Moore Park Stables can provide ponies led by qualified staff for your child and their guest enjoyment. Contact the office for further details and availability of this service in your area. 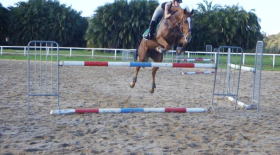 We offer group Jumping classes for riders at all levels of experience several times a week.